Hello Dealsnloot Readers, I Am Back With Flipkart Big Shopping Days Offers, Flipkrt Big Shopping Days : Hello friends again after Flipkart Big Billions Day sale Flipkat is hosting Flipkart Big Shopping Days Offers. This sale will be start from 18th Dec to 21st Dec 2016. here you can win a chance to make your all online shopping totally free of cost. So be ready for 18th Dec to shop online on Fipkart and get chance to get shop 100% free.So Hurry Grab This Loot Offer. The Sale Of Big Shopping Days Will Start From 12 Midnight on 18 December To 21 Dec. So Keep Your Cart and Whist-list Ready and Buy It Successfully From Big Shopping Sale.The Sale Will Be Available On Both Flipkart Website and Flipkart App.See How To Buy Mobiles and Electronics From Flipkart Big Shopping Store. Additional 10% Cashback (upto Rs. 1500) on Rs. 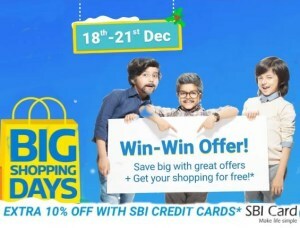 5999+ purchase offer with SBI Credit card. Time To Time Update Some Crazy Deals. 3) Add To Cart Complete Checkout With Any Payment Method. 4) Or Do Cash On Delivery In Flipkart BSD Sale. 5) Enjoy Shopping With Flipkart.